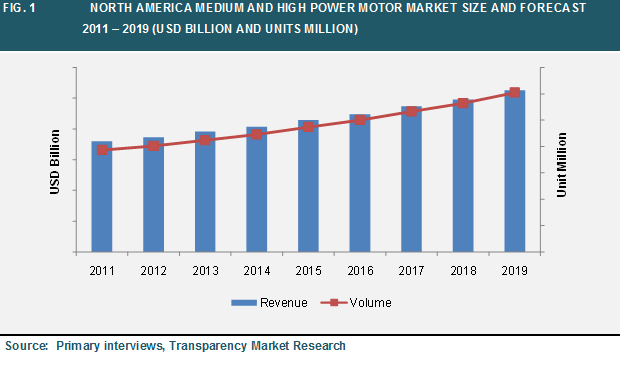 According to a new market report published by Transparency Market Research Medium and High Power Motors Market - Global Industry Analysis, Size, Share, Growth, Trends and Forecast, 2013 - 2019,” the global market is expected to reach a value of USD 69.91 billion by 2019, at a CAGR of 7.3% from 2013 to 2019. The market for medium and high power electric motors is growing steadily with growing industrialization and stringent regulations in industrial electricity consumption. In addition, rising electricity prices and market competition are putting pressure on manufacturing and processing industries to reduce their operating costs. Due to this demand for energy efficient electric motors and motors driven systems is growing rapidly in the global market. In addition, improving economic conditions and financial position of industrial users will encourage industrial users to invest in energy efficient electric motors to improve their production and reduce operating cost. However, lack of awareness about energy efficient electric motors is expected to be the major challenge for this market. Based on output, medium and high motor is categorized into medium power motors and high power motors. In medium power electric motors we have considered motors that have output range between 0.746 KW and 200 KW. High power segment includes electric motors include electric motors that have output range greater than 200 KW. Medium power motors accounted for 46.4% of the global medium and high power electric motors market revenue share in 2012. High power electric motors are specialized motors and accounted for smaller volume share. However, due to higher initial cost high power motors accounted for higher revenue share compared to medium power motors. Medium and high power motors market is also segmented into two major types i.e. AC motors and DC motors. AC motors are further classified into single phase motors and three phase motors and medium power DC motors are further divided into brushed motors and brushless motors. This market was dominated by AC motors and accounted for 79.4% of revenue share in 2012. This segment is expected to maintain its dominating position through the estimated period. Due to declining price of VFDs and other control technologies which improves the efficiency of AC motors is expected to spur the demand for AC motors in the future. Based on efficiency class the medium and high power motors market is segmented into IE1, IE2, IE3 and non-regulated motors. IE2 efficiency class motors accounted for the largest market share of the medium and high power markets as this class is effective in several countries across the world. IE2 motors accounted for 70.7% of the global medium and high power market revenue share. Use if IE3 class motors is currently mandatory in North America. IE3 class motors are expected to see the significant growth through the estimated period with introduction of mandatory regulations to use premium efficiency motors in Europe, China and other markets. Based on applications of medium and high power electric motors we segmented the overall market into the following categories: motor vehicles, HVAC equipment, industrial machinery, aerospace and other transportation equipment, and commercial and other service industries. Industrial machinery segment is further divided into petrochemical, oil and gas industry, food and beverage, medical equipment, pulp and paper, mining and construction equipment, others (elevators, escalators and machine tools). In 2012, the industrial machinery segment was the largest application segment for medium and high power motor providers and accounted for 29.6% of the global market. In 2012, Asia-Pacific accounted for 73.5% of revenue share in the global market. North America and Europe continue to lose their market share with declining gross domestic production (GDP) in major countries such as the U.S., U.K and Germany.